Two fighter jets had to divert an international flight for an emergency landing after a passenger became unruly over her cat. DENVER (WLS) -- Two fighter jets had to divert an international flight for an emergency landing after a passenger became unruly over her cat. The flight from Las Vegas to Germany landed in Denver with those fighter jets. 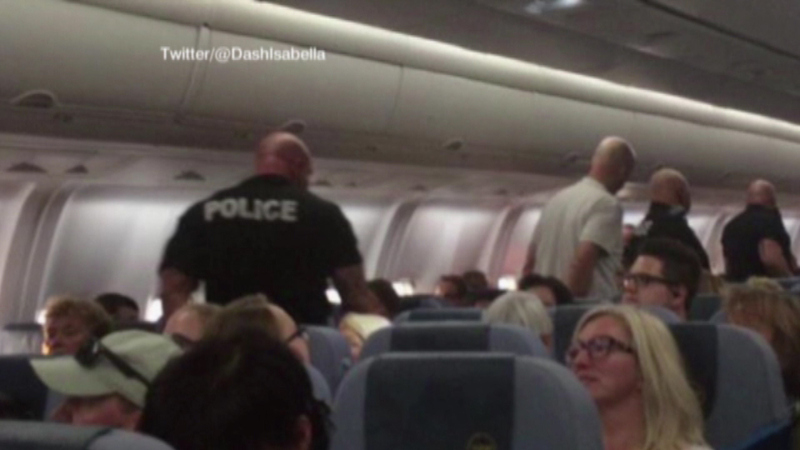 A passenger said a woman was angry and making threats after the flight crew put her cat in a bathroom. The woman allegedly boarded with the animal in her purse and not in a proper pet carrier. "She said that she was part of the mafia and that the mafia follows her around the world and that she was able to bring the plane down if that needed to be the case if she couldn't see her cat," said passenger Dashenka Giraldo. The FBI says the woman is not facing charges. The flight was scheduled to resume Saturday night.